Bill Bruford's Earthworks Returns to the U.S. This weekend, I'll find myself at New York City's Iridium Jazz Club, to see Britain's famed jazz drummer, Bill Bruford. Since the events of 9/11, it has become increasingly difficult to see many of Europe's finest musicians. Visa restrictions and mounting costs have limited many to performing only as far as New York City. Last year at the Iridium, Bruford and his most recent collaborator, saxophonist Tim Garland dealt with that dilemma by hiring several of New York's top jazz musicians to perform, and released the live CD entitled, "The Earthworks Underground Orchestra". Joining Bruford and Garland for this tour however, are Earthworks' newest members, bassist Laurence Cottle, and pianist Gwilym Simcock. Bill Bruford's career is like his drumming sound — inimitable. Known for his ringing metal snare drum, crisp cymbal work, and knack for complex time signatures, a young Bruford came to prominence in the late '60s with Yes. The drummer completed his British art rock trilogy by briefly joining Genesis in the 1970s and spending a quarter-century with King Crimson through the late '90s. In between King Crimson dates, Bruford led a dazzling self-titled jazz fusion solo band from 1978 to 1980 that featured guitarist Allan Holdsworth, bassist Jeff Berlin, and keyboardist Dave Stewart. And even as he leads his visionary jazz band, Bill Bruford's Earthworks, he maintains a career as a session drummer (with artists like guitarists Al DiMeola and David Torn, bassist Jamaaladeen Tacuma, and keyboardist Patrick Moraz). During one of King Crimson leader Robert Fripp's several lineup-shifting hiatuses in Bruford's 1972-1997 tenure, the drummer formed his self-titled Earthworks band in 1986. On its 1987 Earthworks debut album, Bruford often used electric Simmons drums to contrast acoustic horn players Iain Ballamy and Django Bates and upright bassist Mick Hutton, achieving the opposite of the standard lineup where drums are the only acoustic instrument. Subsequent releases like 1989's Dig? and 1991's All Heaven Broke Loose continued this forward-thinking trend, blending acoustic and electric instrumentation and jazz ideology with classical undertones. But by 1993's live Stamping Ground, Bruford had replaced Hutton with electric/acoustic bassist Tim Harries and was using keyboard-pitched electric chordal drums, the combined result being a more muscular and fuller sound. Bruford continued recording and touring with King Crimson through 1997, releasing the Earthworks compilation Heavenly Bodies just as he quit the venerable rock band with which he'd had his longest tenure. It would prove to be a transitional year, as Bruford recorded a jazz chamber trio solo CD called If Summer Had Its Ghosts with legendary jazz figures Ralph Towner (guitar/piano) and Eddie Gomez (acoustic bass). Between explorative electric recordings with bassist and fellow King Crimson alum Tony Levin, Bruford kept Earthworks closer to the chamber jazz mode on the 1999 CD A Part and Yet Apart. Likewise, the lineup of Bruford, saxophonist Patrick Clahar, pianist Steve Hamilton, and bassist Mark Hodgson started the new millennium with the 2001 CD The Sound of Surprise, an outstanding blend of jazz tradition and forward-thinking transition. Bill Bruford grew up with jazz. As an amateur drummer in the 1960s, and after a handful of lessons from Lou Pocock of the Royal Philharmonic Orchestra, he began his professional career in 1968. He was a guiding light in the so-called British "Art Rock" movement, touring internationally with Yes and King Crimson from 1968-74. There then followed several years spent observing and participating in the music making processes of, among others, Gong, National Health, Genesis and U.K., until Bill felt ready to write and perform his own music with his own band Bruford, recording four albums from 1977-80. The late 90s saw Bruford underlining his commitment, and return, to jazz and 1997 saw two major releases. The Earthworks "best of" compilation, Heavenly Bodies, taken from all four albums and including previously unreleased material was released in May on Virgin Record, U.K. Then a late summer release of fresh material with jazz titans Ralph Towner (guitars and piano) and Eddie Gomez (bass) entitled If Summer had its Ghosts, appeared on King Crimson's Discipline Records in September. 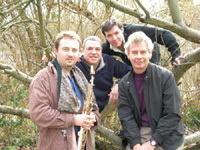 Touring internationally with the second edition of Earthworks, featuring Steve Hamilton (keyboards) and Patrick Clahar (saxophones), the band's live work led to the release of a sixth C.D. "A Part and yet Apart" in 1999. Electronic percussion made way for the warmer looser style of the more conventional sax-piano-bass-drums line up, and Bruford continued to bring the best of the young British players to the attention of a rapidly growing international audience. The new millennium saw a live album release by Bruford Levin’s Upper Extremities entitled B.L.U.E. Nights, and the augmentation of Earthworks with the celebrated jazz guitarist Larry Coryell for the 2000 summer jazz festival season. Following an extensive 22 date tour of the U.K., Earthworks recorded it’s seventh C.D. in November entitled “The Sound of Surprise”. Spring 2002 saw the imaginative simultaneous release of a) a Live Double CD from London called “Footloose and Fancy Free” and b) a full-scale DVD from New York entitled “Footloose in N.Y.C”, and the replacement of Clahar with the multi-talented Tim Garland fresh from Chick Corea’s recent group. The new CD was awarded the coveted "5 Stars" in Downbeat magazine. Weat coast jazz fans are often cheated out of seeing many of Europe's finest musicians, so Bruford's tale is not a unique one. His performances with the original Earthworks band at the Great American Music Hall in the 1990's, and the later incarnation at Yoshi's in 2004, (which resulted in the fabulous CD, "Random Acts of Happiness, Live at Yoshi's"), are just a few of his now legendary bay area shows. Perhaps we will get another chance to see England's greatest jazz drummer here, when the new Yoshi's opens on Fillmore in 2008.